Akit's Complaint Department: BART Access for Senior & Disabled Muni Pass Users? BART Access for Senior & Disabled Muni Pass Users? As many San Franciscans already know, if you have an adult Muni fast pass, you can ride BART within San Francisco for no charge. But how about Muni patrons who are disabled or a senior citizen? 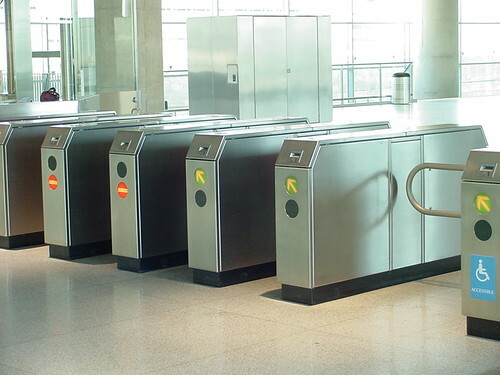 It's very interesting news that both the BART and Muni's Board of Directors have agreed on a pilot program in 2008 to try out senior and disabled passes on the BART system within San Francisco for eighteen months. It took BART a year to prepare and set-up this program on their fare gates. Muni is looking for volunteers to try out this program for six month periods (a total of three trial periods), and will be selected out of a random lottery conducted by the SFMTA. A total of 2,000 people will participate in this program and will not cost anything extra (it's still $15). For disabled customers, you need your RTC discount card; Seniors need to have their state issued ID card or their RTC card. No ID, no participation. People who are picked for the program can only purchase their pass at three designated locations: SFMTA customer service center, Montgomery station, and the Cable Car turnaround ticket booth at Powell and Market. The pass is available for purchase only on the third week of the month (usually only a four to five day window). You agree to do occasional surveys. The pass must be carried with an RTC card or photo ID at all times (it's a universally understood policy for all transit agencies). From the sound of this, it looks like participants will receive a paper pass, even if a person is disabled and use a monthly Muni sticker for the RTC card. Muni stated on their website, their long-term goal is if this pilot program is successful, they want to integrate the paper passes to the Translink program. It's actually better for Muni to pilot this program with paper passes because Cable Cars and the "rare" (non-PCC and Milan) F-Market streetcars are not equipped with Translink technology. To learn more, and/or to register for the lottery: visit this website or call San Francisco 311.